What are the first six words that pop into to your head when you hear the words fulfillment, success or happiness? Before I tell you why, please write them down. The other day, my friend and fellow coach at IESE Business School, Tony Anagor — Cofounder of LifestyleDMC and Lifestyle Barcelona, companies that specialize in organizing unique events and experiences — was invited to give a talk to MBA students from around the world who were in Barcelona as a part of the University of Manchester’s European Summer Study Programme. When Tony asked me if I’d like to share the stage with him, I immediately jumped on board: for me students mean the future, and I like being in touch with the future. Time: Plenty of resources and no time to use them is not worth much. So, how much time do you have for you? Not for personal obligations apart from work, but time for your thing? I find that sometimes even my free time is booked. Autonomy: Resources and time are useless if you’re not free to do with them what you desire. In the end, the goal is to live and work like you’re your own boss. Self-determination is a key factor for lasting motivation. Balance: Juggling the different areas of your life is an art. It can also be your dismay. A fulfilling life is like an orchestra. It’s not enough to play one instrument well. You want all of them to do well and to do it together. Meaning: With the resources, time and opportunity to live life on your terms and balance in doing so, you’re also going to need meaning. Life needs to make sense. What good is a wonderful orchestra isolated in a soundproof room where no one can hear it? to something bigger than itself lacks purpose. Suspense: This is one of my favorites. I wrote about it in a previous post. Fulfillment is not about reaching the finish line. It’s about learning the game, keeping it going and ultimately becoming a game changer! This ongoing process requires excitement and energy. And without suspense, that’s really not possible. 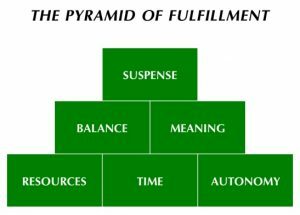 What does your pyramid look like? I’m sure there are other significant pieces we could add. Love to hear about it.